While visiting New England a few years ago, I made a point of driving out to Salem, Massachusetts- the village best known for the infamous witch trials of 1692. Beyond Monty Python’s brief interpretation of it in Holy Grail, I had no concept of how it was possible for mere mortals to confine and execute someone who apparently had command of the supernatural. 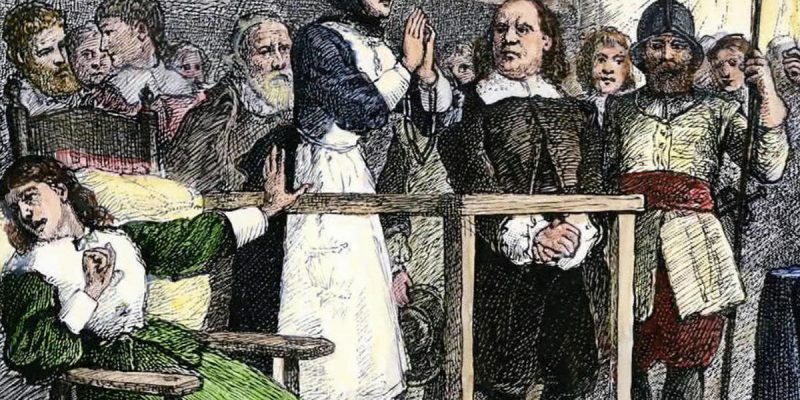 If the men and women fingered were truly familiar in the black arts and devilry, wouldn’t their powerlessness in the face of impending execution prove their innocence? However the powers that be truly weren’t that interested in ridding the village of practitioners of sorcery but undesirables and those individuals whose property were coveted by those on the safe side of the Court of Oyer and Terminer. Determining the truth of the charge did not matter so much as seeking a conviction. What passed for evidence were mere accusations and quackery. At the end of the frenzy 19 people were hanged (though no actual witches). And then there was the fate of Giles Corey. The 80 year old farmer was accused of being a “dreadful wizard”. Yet when hauled before the court, the stubborn Corey refused to enter any plea, which complicated matters as one could not be put on trial sans plea. The Puritans had a solution for that: pressing. And so when DC Court of Appeals Judge Brett Kavanaugh, after being subjected to days of unsubstantiated and outright absurd accusations, was offered his chance to “plea out” of his nomination to the US Supreme Court, the battered jurist delivered a similar defiant statement. And the Democratic members of the Senate Judiciary were only too happy to pile on the rocks. The Democrats alternated from behaving like Soviet commissars running a show trial to the infamous German judge Roland Freisler, hurling denunciations from the dais. Nothing about the man’s life was spared, including Judge Kavanaugh’s high school activities and college beer consumption from three decades ago, delving through his high school yearbooks, and questioning about his references to flatulence. If the public seems confused why the Democrats were essential putting Kavanaugh the teenager on trial instead of the respected fifty-three-year-old federal judge sitting before them, it is because they could not successfully argue against the latter so they had to go after the less mature version of him. And what adult going up for a job interview anywhere would want to be judged on their teenaged self? At this point the game was not so much to argue against his qualifications to serve on the US Supreme Court but to goad the public into personally hating him so the electorate will be more apt to tolerate the Democrats’ boorish tactics. In contrast to the patience and courtesy extended to Judge Kavanaugh’s accuser Professor Christine Blasey Ford, President Trump’s second nominee to the high court was insulted, degraded, and heckled by unhinged Democratic senators, some of whom have actually proven severe character flaws. Take for example, US Senator Richard Blumenthal from Connecticut, who falsely claimed he had served in Vietnam. Amazingly after having been busted in this lie, the voters of Connecticut still sent him to Congress’ upper chamber. And then there’s “Spartacus” Cory Booker, who has admitted to committing sexual assault when he grabbed a friend’s breast in high school. And of course the entire Democratic caucus was silent on why ranking committee member Diane Feinstein never confronted Judge Kavanaugh about Dr. Ford’s allegations in their meetings and why she sat on the information for six weeks, which would have afforded plenty of time to more thoroughly vet witnesses and accusations. The answer is assuredly to engineer the derailing of Judge Kavanaugh’s confirmation beyond the mid-term election and perhaps their own suspicions about the credibility of the charge made against him. This isn’t how a civil democracy is supposed to function and this is not how any individual should be treated by US Senators, especially after the gauntlet Judge Kavanaugh and his family have endured. The Democrats’ ‘return to Salem” is a stain on their party, the characters of their caucus, the institution of the senate, and the judicial nomination confirmation process. Regardless of whether he is confirmed to the US Supreme Court, Judge Kavanaugh’s reputation has been crushed no different than the body of Giles Corey. Both victims of hysteria. Judge Kavanaugh and his family deserved better as does the country.